In the ancient Egyptian funerary belief, Isis and Nephthys were crucial for the death resurrection. Two professional mourners in the role of Isis and Nephthys played mourning ritual over the mummy (Osiris). With it, the corpse recovered all the vital functions, which granted a complete life in the Hereafter. For that reason, the funerary iconography of Ancient Egypt included always images of these two godesses in the tomb and/or on the coffin, mummies, cartonnages… Because the image guaranteed the mourning ritual for the eternity. 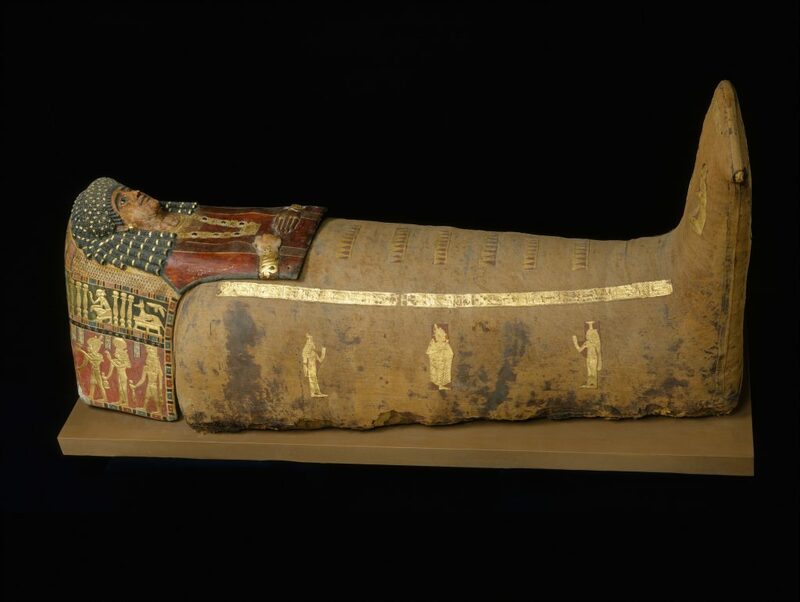 There are many examples of Egyptian coffins whose decoration includes the two figures of Isis and Nephthys, even in Roman period. At that point, we consider very interesting the iconography on the mummy of Artemidora, dating from ca. AD 100 and coming from Meir (Middle Egypt). It has decoration mainly in the mask, but aslo a little bit with appliqués over the wrappings. The decoration of the coffin of Artemidora. The mummy of Artemidora is barely decorated. However, the limited iconography is dominated by the figures of Isis and Nephthys. It seems that the images were really chosen with a purpose. At both sides (right and left) of the body. At both lateral sides of the funerary mask. On the backside of the head in the funerary mask. The question, which comes to us, is why Isis and Nephthys appear so many times in such a small space and are so preeminent in the decorated surface of this coffin. Isis and Nephthys on the feet of Artemidora.